Welcome to Prairie Story Recipe Swap Thursday! This week we're celebrating the big 50! 50 wonderfully delicious Recipe Swaps!! The most popular recipe from Recipe Swap Thursday last week was Better Than Coach Cake @ Everyday Mom's Meals. Oh my!! 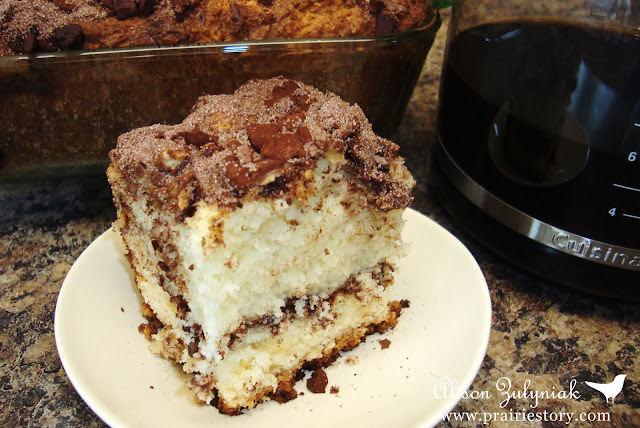 This week I'm sharing my Great Aunt Clara's Coffee Cake. I was so happy to find a little section in one of my Grandma's recipe scribblers called Clara's Korner where there were many of my great aunt's baking recipe! You share such lovely recipes Alison, and they are all the more special for their history. Your Aunt Clara's coffee cake sounds like a real classic, and I can't wait to try it! Thank you for hosting, and congratulations on 50 weeks of the Recipe Swap! Wow! This cake is popular! It got the most viewed on another blog to! Thanks so much!! Your coffee cake looks amazing Alison! I definitely want to make that. Thank you again for the link up party!! Can't wait to try that coffee cake. My husband will love it. Thank you for allowing us to share our recipes.